His synthesiser, which bears his name, revolutionised music from the 1960s onwards, and was used by bands like the Beatles and the Doors. Today, the electronic manipulation of sound is a ubiquitous feature of popular music. 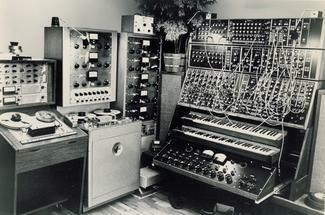 This was not always the case, and Moog was one of the pivotal pioneers of synthesised sound. His instruments transformed pop music during that most revolutionary and experimental of times, the 1960s. Alongside his hobby, Moog was studying hard. From the Bronx High School of Science, he went on to Queens College, before graduating in electrical engineering at Columbia University and earning a doctorate in engineering physics at Cornell. Although RCA had already built a musical synthesiser, it was a vast beast, and never intended for sale. What Moog did, in 1964, was to produce and market a practical instrument, a small keyboard synth which could be used with relative ease. Hollywood soon expressed an interest, but it was Wendy Carlos' 1968 Grammy-winning album, Switched-On Bach, which brought the Moog synthesiser to spectacular prominence. Before long many musicians and groups, including the Doors, the Grateful Dead, the Rolling Stones and the Beatles, were using Moog synthesisers. Keith Emerson, of Emerson, Lake and Palmer, was the first musician to use one for live concerts. 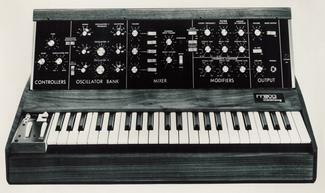 These two photographs show the monstrous Moog synthesiser used in Switched-on and the other the Minimoog model. But the boom days were not to last. Even though the Minimoog, a stripped-down version of the original instrument and beloved by artists like Rick Wakeman, made waves when it came out in 1970, the writing was on the wall. With interest in purely electronic sound falling, and huge competition from other synthesiser manufacturers, most notably ARP Instruments and Electronic Music Studios, the bottom fell out of the market. Synthesisers evolved from the analog model of voltage control to digitally controlled model, and then to the wave table model of the modern machines. Bob Moog sold a controlling interest in his struggling company and, more important, rights to the Moog Music name to a venture capitalist. In 1978, he started a new company, Big Briar, building custom instruments and sound-effect boxes. Even so, many musicians, including Brian Eno, Frank Zappa, The Cure and Fat Boy Slim, sought the Moog sound, keeping it alive, even as analogue synthesisers were wiped-out by their digital cousins. After a lengthy legal battle, Moog reclaimed the rights to the Moog brand in 2002 and began selling instruments bearing his name for the first time in more than two decades. I often heard the term Carpe Diem, on many occasions from the religious, and also friends and colleagues. This is a common term which means seize the day, but there is much philosophy behind. Seize what, that is the question. On one hand, it encourages people to treasure time to do meaningful things. On the other, some adopt the attitude of not doing anything but to play for the day. So I ask the almighty Internet for an answer. Carpe diem is Latin for "pluck the day," meaning "enjoy the moment". It has been translated into English as "seize the day," but carpere means "to pluck." This rule of life can be traced back more than 2000 years and be found in the "Odes" (I, 11.8) of the Roman poet Horace (65-8 BC), where it reads: Carpe diem quam minimum credula postero ("pluck the day, never trust the next") It is quoted accordingly either as a demand not to waste somebody's time with useless things, or as a justification for pleasure and joy of life with little fear for the future. Roman culture and literature had declined thereafter and Europe underwent the medieval period for over 1000 years. Then came the Renaissance with an enthusiasm in the rediscovery of ancient classical texts and learning and their applications in the arts and sciences. Horace's Odes became fashion and influenced poetry of the day. This idea carpe diem was popular in 16th and 17th-century English poetry, made famous by Robert Herrick and William Shakespeare. To go with the culture of the feudal system where kings and nobles were exploiting the mass and lived in luxurious way, carpe diem in poetry also portrayed hedonism. The most recent fad on carpe diem came from Robin Williams' character as a teacher of a boys' boarding school in the film "Dead Poets Society". Powerful and famous lines were spoken by Robin Williams to the students when he introduced the dead poets to them: "But if you listen real close, you can hear them whisper their legacy to you. Go on, lean in. Listen, you hear it? - Carpe - hear it? - Carpe, carpe diem, seize the day boys, make your lives extraordinary." The moral of Dead Poets Society reminds us to seize each day and cherish them dearly. Every day opportunities await us and we must decide whether to take the chance or play it safe. The main theme was an encouragement to the students to take the risks, for nothing is gained without them. Risks were taken; the result was extraordinary; the film has a sad ending. To me, the message is simple. If life is short and there may not be tomorrow, then we must seize the day and do the most valuable thing. The most valuable thing is a valuable personal value judgement. While sky is the limit, I think the most immediate valuable thing is to complete the task at hand in the most satisfactory manner.